a dough-y ball of sweet goodness! There are a lot of possible stressors in the kitchen, but I strongly feel that the kitchen is a place where stress should be relieved not added. If I let baking stress me out, I would certainly be in quite a predicament at the moment (launched a bit of a baking business in order to raise money for an upcoming mission trip). So, here are some personal tips if you are finding yourself conditioned to dread the combination of cookie dough and cookie sheet. Yes, I do have and use measuring cups… occasionally and as strong suggestions. I believe strongly in the power of estimation and (to be honest) I enjoy the uncertainty and risk involved in “eye-balling it,” as my mother used to say. I hope this is an indicator of a future of full kitchens: I like to bake while talking, singing, and laughing. 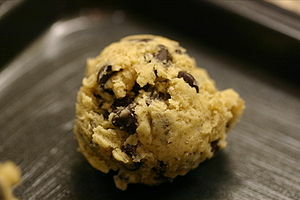 I’ve also been known to have the occasional intellectual discussion over a healthy lump of cookie dough and I highly suggest it. No philosophical argument will come to fists when you’ve got something as sweet as cookies in the oven (with gooey fingers)! If I’m not talking on skype, hanging out with friends, then I’m singing my favorite sounds and some you can get for free: noisetrade, briterevolution, designers.mx, just to name a few. Everything while you are baking is EDIBLE, so don’t forget you can clean up/taste test all in one enjoyable finger swipe! While baking and talking to my mom on skype about this stress-free post, she says, “don’t forget about the flotsam and jetsam…” to which I reply, “I have no idea what language you are speaking right now, mom.” After a half second blank stare, she says, “Well, I don’t really know what it is either…. (giggles) but I’ll look it up for you.” We finally figure out it’s originally a nautical term used to describe floating debris or items thrown overboard. Apparently, my mom thinks this also means things spilled in the kitchen. I’ll take it, mom. Here’s the deal, folks: you will inevitably get a wee bit past the recipe-prescribed “golden edges” every once in awhile. It’s just one of those kitchen facts of life. So, be “easy” as my Canadian friend Heather would say. Just go with the flow and, trust me, there is always somebody who genuinely prefers cookies the way you’ve just taken them out of the oven. Burnt, brown, or between gooey and barely baked… they will get eaten and enjoyed! As much as I want to say clean up can be skipped entirely – that’s actually a way for you to smother all the silly cheer of freshly baked goods. My method? Scrub a dish or two while the cookies are in the oven. As I use bowls, spoons, etc., I collect things in one bowl and put it in the sink to soak so when I do get to it everything is in a clean-ready state. I might also use already floured, sugared, and soda-ed utensils over again in a different recipe if I’ve got many things happening at once (regular occurrence). Lastly… keep the conversation or music going through cleaning. I certainly don’t like to be standing at the sink alone, scrubbing out the last bits of tasty cookie remains from a pan. No need to resent the cookies for making a mess! Even clean up can be social! Okay – so there are 5 things. I’m learning here and I’m hoping to store some of these lessons for the days I can manage my own kitchen. If baking is as stress-free as I just made it sound, I might want to think about a new career! This entry was posted in cooking and baking, creativity, writing and poetry. Tagged Baking, Cookie, Home.